Catelin Infante, Jessica Frederick, Kristin Casagrand, Jarrod Smith from the Bellarmine University Physical Therapy Program's Pathophysiology of Complex Patient Problems Project. Ms. Johansson comes into the clinic complaining of joint pain and muscle weakness, especially in her hands, hips and shoulders. She explains that she has been having trouble making it through a full day of work because her body feels limited and she just cannot reach as well for boxes at her job because "her arms won't go up that far". She also has noticed that she gets out of breath and sometimes has chest pain when she lifts a lot too quickly. Ms. Johansson indicates that her fingers often feel very swollen and stiff and sometimes feel "stuck" in a bent position. She reports that for several months she has been getting a really cold, numb feeling in her fingers throughout the day, especially when she is sitting in the air conditioning at her office. Overall, she has just not felt well for the past few months either. When she eats, she has trouble fully opening her mouth to put food in. Then, when she lies down at night after dinner, she gets a feeling of heartburn and sometimes feels she has to vomit. However, she says she has been eating poorly lately, so it's probably her fault she hasn't felt well. Additionally, Ms. Johansson reports losing 20 pounds in the past month without any lifestyle changes. Her goals for therapy are to decrease her joint pain and to get her muscles stronger so she doesn't struggle at work any longer. Her focus is on getting her hands and arms "back to normal" because they are what she uses most in her job. Verbal Pain Intensity Scale: "Severe pain"
After Ms. Smith's assessment, we have determined that she has decreased range of motion in her fingers and wrists, decreased cardiovascular endurance, decreased muscle mobility, as well as increased muscle weakness and fatigue. All of these impairments have impacted her functional ability to do activities at home and in the work place. Physical therapy could benefit Ms. Smith by improving her impairments that were found and by providing patient education on management of her condition. The interventions during PT would include active joint range of motion, strengthening exercises and aerobic exercises to improve endurance, as well as education on a home exercise program and management of the symptoms of her condition. With the help of physical therapy, Ms. Smith would likely be able to reach her goals for improving her strength and endurance and decreasing her joint pain so that she can particpate in more activities at home, work and in the community. Targeted intervention for Physical therapy for this patient would be improving available range of motion, joint protection and preservation along with patient education. Based on Evaluation and examination information patient should be educated on proper protection of affected joints with education on temperature monitoring to reduce symptoms. Light range of motion should be built in to the intervention in a safe manor to preserve range that will progress to light strengthening of affected joint as long as joint integrity is not in jeopardy. SMART framework - combines physical therapy sessions with self-management of care through a home exercise program. The PT session focuses on designing an individualized program for each patient in order to treat their specific impairments and goals. The sessions are planned less frequently during the week, but spaced out over a longer period of time. This is to help shift the focus of the care to self-managed that way the patient can manage their condition for the long-term. The HEP uses exercises, self-stretches and paraffin to help the patient manage their condition at home. The patient is given 4-5 exercises that are performed 1-2 times per day, for 5 days per week. As the same for the dosage and parameters, each individual has a different presentation of scleroderma and the associated symptoms and impairments., Each individual should progress through their rehabilitation according to their reaction to the exercises. Each should be monitored closely, especially with the aerobic exercise, and progressed in a safe manner according to their bodies' response to exercise. The physical therapist must also consider the phase of the disease that the patient is in and their progression through the disease phases. Miss Smith participated in a successful physical therapy plan of care related to her medical diagnosis of systemic scleroderma. Miss Smith was able to articulate her understanding of the disease progression of scleroderma, including the different stages of the condition. She was also able to explain to her physical therapist what activities should be performed in each stage, which is an excellent way to ensure patient understanding. The completion of a variety of range of motion activities adapted for Miss Smith's current needs encouraged increased ROM of her hands and wrists along with resistance exercises to increase the strength of her hand intrinsics served to decrease Miss Smith's perceived level of difficulty in completing her ADL's. Aquatic therapy was utilized in a variety of methods. Its greatest impact was seen in Miss Smith's aerobic capacity, which increased and allowed her to become more active at home and in the community. Due to the progressive nature of scleroderma, it was very important for Miss Smith to understand how physical therapy will be important to maintain her abilities to perform ADLs and remain active in the community. She verbally acknowledged that she will need to continue to monitor her condition, and to continue her physical therapy exercises and activities after discharge. Miss Smith was educated on how changes in her symptoms (including decreasing range of motion, strength, and increasing levels of fatigue) may indicate the need for a re-evaluation by her physical therapist to continue to promote her current levels of independence. Despite the low levels of prevalence of scleroderma, additional research is needed related to the physical therapy portion of treatment.As scleroderma is a systemic disorder, it is imperitive that these patients receive interdiscipliary care with consistent communication between healthcare providers. Current literature suggests that specific range of motion activities, resistance exercises, and cardiovascular activities may increase a patient's quality of life and decrease functional limitations in their daily life. However, many of these studies consist of a limited pool of subjects, additional research will help to further develop an evidence based model for physical therapy treatment of scleroderma. ↑ 1.0 1.1 1.2 1.3 1.4 Goodman CC, Snyder TEK. Differential Diagnosis for physical therapists. 5th ed. St. Louis, MO: Elsevier Saunders, 2013. ↑ 2.00 2.01 2.02 2.03 2.04 2.05 2.06 2.07 2.08 2.09 2.10 Lonneman, E. Connective Tissue Disorders Part II. [unpublished lecture notes]. Bellarmine University DPT Program; notes provided at lecture given 2015 February 23. ↑ Johns Hopkins Scleroderma Center. Understanding scleroderma. http://www.hopkinsscleroderma.org/scleroderma/ (accessed 21 March 2015). ↑ Williams SL. Pain perspective in scleroderma. The Rheumatologist 2011. http://www.therheumatologist.org/details/article/1246911/Pain_Perspective_in_Scleroderma.html (accessed 21 March 2015). ↑ Varju C, Balint Z, Solyom AI, Farkas H, Karpati E, Berta B, et al. Cross-cultural adaptation of the disabilities of the arm, shoulder, and hand (DASH) questionnaire into Hungarian and investigation of its validity in patients with systemic sclerosis]. 2008; 776-784. http://www.clinexprheumatol.org/article.asp?a=3486 (accessed 21 March 2015). ↑ 6.0 6.1 6.2 6.3 Sawy NE, Suliman I, Nouh M, Naguib A. Hand function in systemic sclerosis: a clinical and ultrasonographic study. The Egyptian Rheumatologist 2012; 34(4): 167-178. http://www.sciencedirect.com/science/article/pii/S1110116412000452 (accessed 21 March 2015). ↑ Yuen HK, Marlow NM, Reed SG, Summerlin LM, Leite RS, Mahoney S, et al. 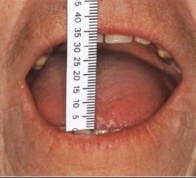 Effect of orofacial exercises on oral aperture in adults with systemic sclerosis. Disabil Rehabil 2012; 34(1): 84-89. http://www.ncbi.nlm.nih.gov/pmc/articles/PMC3437654/ (accessed 21 March 2015). ↑ Pocket Dentistry. Manual functional analysis. http://pocketdentistry.com/manual-functional-analysis/ (accessed 21 March 2015). ↑ 9.0 9.1 9.2 National Institute of Arthritis and Musculoskeletal and Skin Diseases. Scleroderma. http://www.niams.nih.gov/Health_Info/Scleroderma/default.asp (accessed 21 March 2015). ↑ 10.00 10.01 10.02 10.03 10.04 10.05 10.06 10.07 10.08 10.09 10.10 Goodman CC, Fuller KS. Pathology: implications for the physical therapist. 3rd ed. St. Louis: Saunders Elsevier, 2009. ↑ 11.00 11.01 11.02 11.03 11.04 11.05 11.06 11.07 11.08 11.09 11.10 Poole JL, MacIntyre NJ, deBoer HN. Evidence-based management of hand and mouth disability in a woman living with diffuse systemic sclerosis (scleroderma). Physiotherapy Canada 2013; 65(4): 317-320. ↑ 12.00 12.01 12.02 12.03 12.04 12.05 12.06 12.07 12.08 12.09 12.10 12.11 12.12 12.13 Wolff A, Weinstock-Zlotnick G, Gordon J. SSc management – In person appointments and remote therapy (SMART): A framework for management of chronic hand conditions. 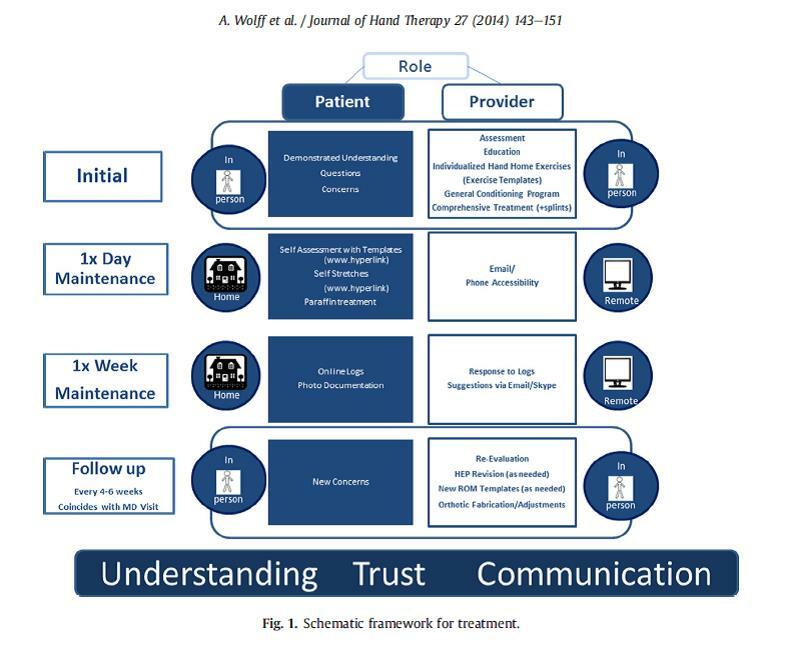 Journal of Hand Therapy 2014; 27: 143-151. ↑ 13.00 13.01 13.02 13.03 13.04 13.05 13.06 13.07 13.08 13.09 13.10 13.11 Attia MW. Evidence-based physical therapy for patients with scleroderma [dissertation]. Ann Arbor: UMI Dissertation Publishing. 2014. ↑ 14.00 14.01 14.02 14.03 14.04 14.05 14.06 14.07 14.08 14.09 14.10 14.11 Bongi SM, Rosso AD, Galluccio F, Tai G, Sigismondi F, Passalacqua M, Landi G, Baccini M, Conforti ML, Miniati I, Matucci-Cerinic M. Efficacy of a tailored rehabilitation program for systemic sclerosis. Experimental Rheumatology 2009; 27(Suppl. 54): S44-S50.